The Hubble Space Telescope saw the formation of a 'Great Dark Spot' last year. This composite picture shows images of storms on Neptune from the Hubble Space Telescope (left) and the Voyager 2 spacecraft (right). 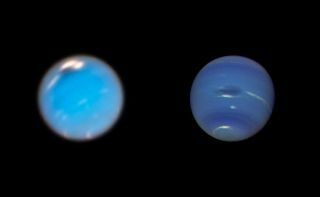 The Hubble image of Neptune, taken in September and November of 2018, shows a new dark storm (top center). In the Voyager image, a storm known as the Great Dark Spot is seen at the center. It is about 8,000 miles by 4,100 miles (13,000 by 6,600 kilometers) in size. The white clouds seen hovering in the vicinity of the storms are higher in altitude than the dark material. For the first time ever, astronomers have witnessed the birth of one of Neptune's enormous "Great Dark Spot" storms. Astronomers were studying Hubble Space Telescope images of a relatively small Neptune maelstrom that formed in 2015 when they noticed bright white clouds forming in a different locale on the ice giant. By 2018, a dark storm as wide as Earth had boiled up in that region, the researchers announced in a study published today (March 25) in the journal Geophysical Research Letters. "We were so busy tracking this smaller storm from 2015 that we weren't necessarily expecting to see another big one so soon," study lead author Amy Simon, a planetary scientist at NASA’s Goddard Space Flight Center in Greenbelt, Maryland, said in a statement. The find brings the total tally of observed Great Dark Spots on Neptune to six. The first two such disturbances were detected by NASA's Voyager 2 probe during its Neptune flyby in August 1989, which provided the first up-close look at the mysterious blue planet. Hubble discovered the other four spots. Indeed, Hubble imagery has been key in characterizing these dramatic, otherworldly storms. For example, photos captured by the space telescope in 1994 revealed that the two tempests seen by Voyager 2 had dissipated, revealing that Great Dark Spots don't last very long, at least by giant-planet standards. "It was certainly a surprise," Simon said. "We were used to looking at Jupiter’s Great Red Spot, which presumably had been there for more than 100 years." The Great Red Spot, which has been observed continuously since at least 1830, is confined to a narrow latitude range by Jupiter's jet streams. But Neptune's Great Dark Spots wander around the planet much more freely before they're finally ripped apart by high-altitude winds, the researchers said. Witnessing the birth of a Great Dark Spot sheds additional light on these mysterious features. For example, the association between the newborn storm and those bright white clouds, which are composed of frozen methane, suggests that the spots take shape deeper in Neptune's atmosphere than previously thought. The methane clouds likely float above Great Dark Spots the way "lenticular" clouds hover over tall mountains here on Earth, study team members said. Simon conducted the new study with Michael Wong and Andrew Hsu, both of whom are at the University of California, Berkeley. In a second study — also published today, in the Astronomical Journal — the researchers used Hubble observations to estimate the frequency of Great Dark Spot formation on Neptune. Such storms likely crop up every four to six years, the scientists found. And each Great Dark Spot probably lives for just two years or so, though some may reach the ripe old age of six. There's still a lot to learn about Great Dark Spots, however, such as their wind speeds. Further Hubble observations and analyses could help unlock these and other mysteries, study team members said. "We have never directly measured winds within Neptune’s dark vortices, but we estimate the wind speeds are in the ballpark of 328 feet (100 meters) per second [223 mph, or 359 km/h], quite similar to wind speeds within Jupiter’s Great Red Spot," Wong said in the same statement.